A shaky start has been set for the host nation who struggled to bank their first game with a win. The Fiji squad proved too strong on the physical aspects of the game, dominating majority of the clash against the Cook Islands and winning three goals to nil. However, having tasted their first experience of regional competition, the Tuka Tisam-coached squad can grasp a sense of what is to be expected of their future opponents and hone in on their game plan. Tisam noted the importance of learning from their mistakes saying they can only go forward from here. “We will learn from that and get better for the next game. With a day to rest before they take to the field again, team Cook Islands will need to recuperate in time for an experienced PNG side. “PNG is a very good side. A couple of injuries from the Cook Islands side may cause as a liability for the team but Tisam is positive he can still produce a strong squad for their next game. 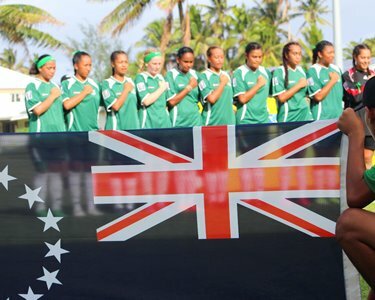 Team Cook Islands is in Group B along with PNG, Vanuatu and Fiji. They will need to beat their next two opponents if they hope to succeed to the next round of the tournament. Their next game against PNG will take place on Saturday 16, at 5:00pm.